In this account, the Jerusalem tattoo indelibly marks the traveller so that he has a permanent reminder of his journey: an instance of the skin absorbing a ‘pilgrim badge’ which can be displayed upon the return home and act as a permanent link to scripture. Note the comparison which Terry makes between marking the body and drawing with ‘pencil’ upon ‘Parchment’, an echo of the physicality of the book. […] the last day of our staying there, wee went all of us Frieres and Pilgrimes in againe to the Holy Grave, where we remained all night. 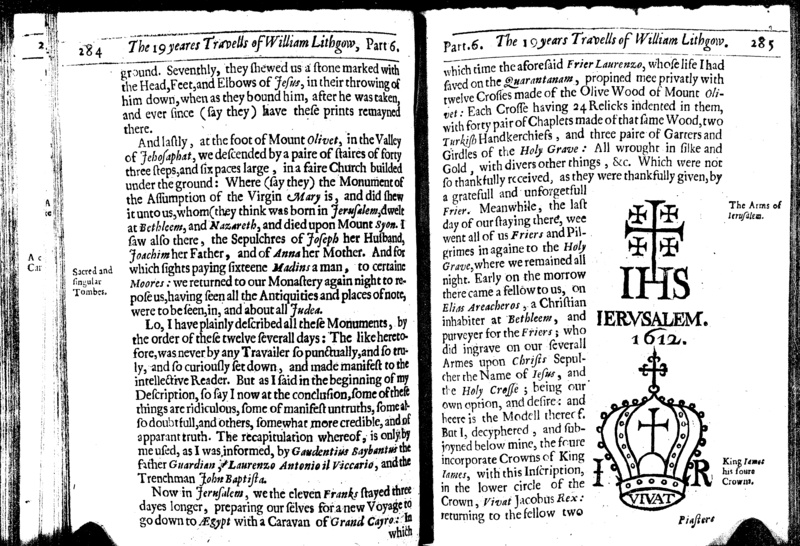 Early on the morrow there came a fellow to us, on[e] Elias Areacheros, a Christian inhabiter at Bethleem, and purveyer for the Friers; who did ingrave on our Severall Armes upon Christs Sepulchre the name of Iesus, and the Holy Crosse; being our own option, and desire…But I, deciphered, and subjoined below mine, the foure incorporate Crowns of King Iames. In joining the name of Christ to the crown of King James, Lithgow ensured that his skin bore the marks of both his religious and his national identity. Lithgow helpfully included a diagram of his tattoo in his narrative – depicted above. The pilgrim’s desire to have his or her body display a permanent and tangible reminder of the journey to the Holy Land raises the question as to whether converts (particularly Christian converts who did not practice circumcision) also marked their religious metamorphoses in comparable ways. Let us know if you find a tattooed convert! This entry was posted in Case studies and tagged Abi Shinn, Jerusalem, Pilgrimage, tattoos, travel narratives. Bookmark the permalink.